Keep your new year’s resolutions with our sugar-free chocolates! For many people, the new year comes with a set of resolutions that are designed to make their lives better. One of the most popular resolutions people make is to eat healthier, which they may think means having to give up sweets. This is not the case at all! There are plenty of ways you can satisfy your sweet tooth while still maintaining your new year’s resolution. Hard candies are a great option for people who are looking for something sweet in moderation. These candies are typically wrapped individually, which makes it easier for you to eat them in moderation. They’re also packed with flavor; your sweet tooth will surely be satisfied by a few of them! Like most things, moderation is essential when you’re enjoying sweets. They shouldn’t make up the most significant part of your diet, but only serve as an occasional treat. There is nothing wrong at all with eating a few sweets now and then. You might even find it helps you stay consistent with your overall resolution to eat healthier. Allowing yourself the occasional treat may help prevent you from overeating later. If you’re looking to enjoy treats without worrying about the sugar content at all, try some sugar-free candies and chocolates! Many people who have diabetes enjoy these candies, but even if you don’t have it, you can still savor them. They can provide a great alternative to the chocolate you’re used to eating without making you sacrifice taste. If you don’t feel like switching to sugar-free candies completely, you could incorporate some into your general candy consumption. 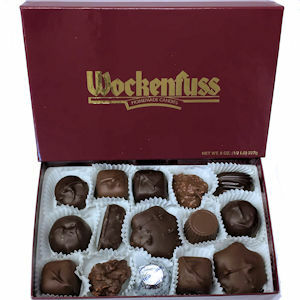 Here at Wockenfuss, we offer sugar-free candies like gummi bears and a wide variety of sugar-free chocolates too! This entry was posted on Tuesday, January 22nd, 2019 at 5:30 pm. You can skip to the end and leave a response. Pinging is currently not allowed.